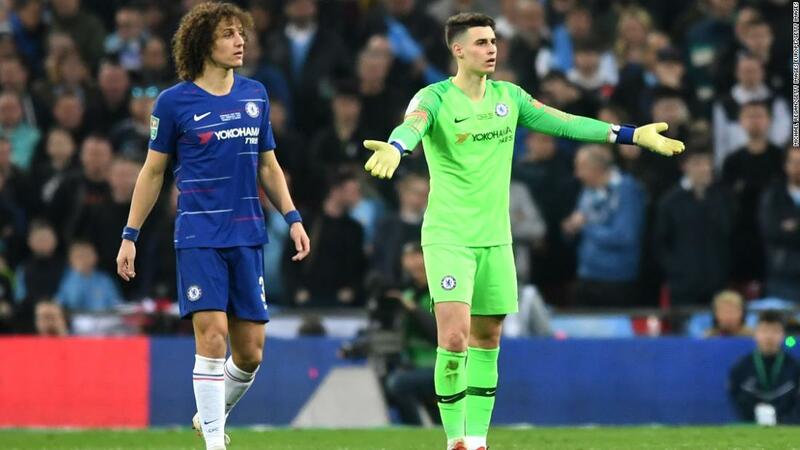 (CNN) Chelsea manager Maurizio Sarri was left apoplectic on the sidelines of the Carabao Cup final after his goalkeeper appeared to refuse orders to be substituted, shortly before his side succumbed to Manchester City in a penalty shootout. 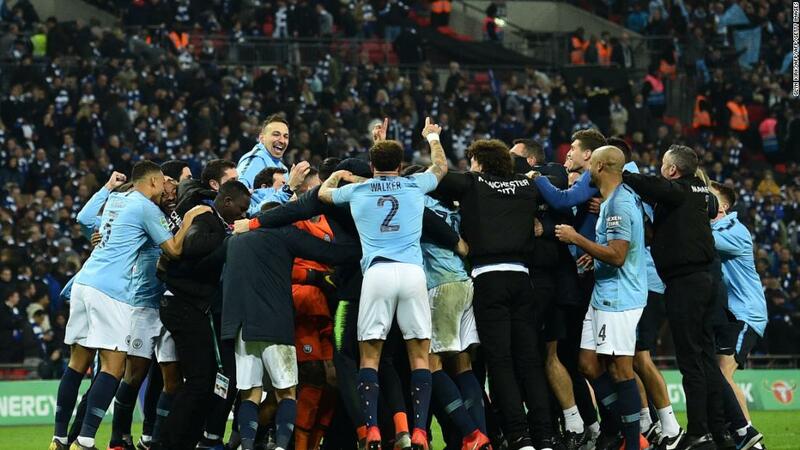 The man who was supposed to replace him, Willy Caballero — the penalty hero in the 2016 final for City — never made it onto the pitch and while Arizzabalaga denied Leroy Sane, he allowed Sergio Aguero’s tame effort to squirm under him. Tied 2-2 in the spot kicks, the normally reliable David Luiz hit the post for Chelsea and Sterling sealed proceedings three kicks later. 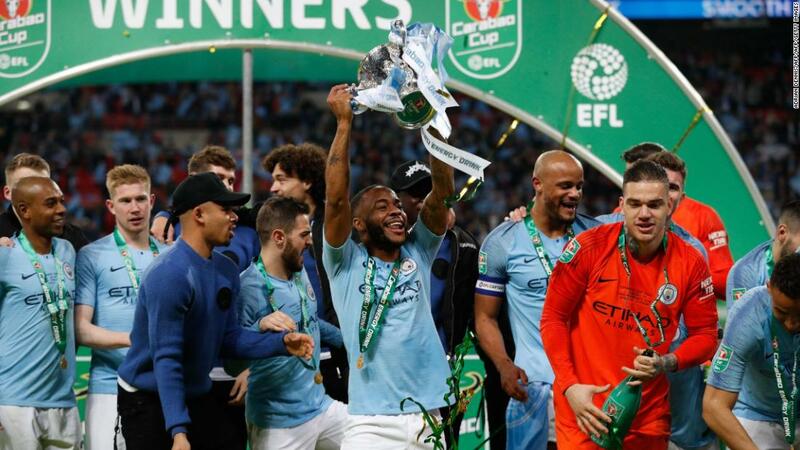 Raheem Sterling’s emphatic finish into the top corner past Arrizabalaga gave City a 4-3 win in the shootout at Wembley on Sunday after the teams played to a 0-0 draw through 120 minutes. The win leaves it one trophy down, three to go for quadruple-chasing City. Arrizabalaga’s refusal to leave the pitch — despite appearing to suffer from noticeable cramps — drew fire from his under-fire boss, who ripped his sweatshirt open in frustration and was headed down the tunnel before making a U-turn and returning to the touchline to watch the penalty shootout. 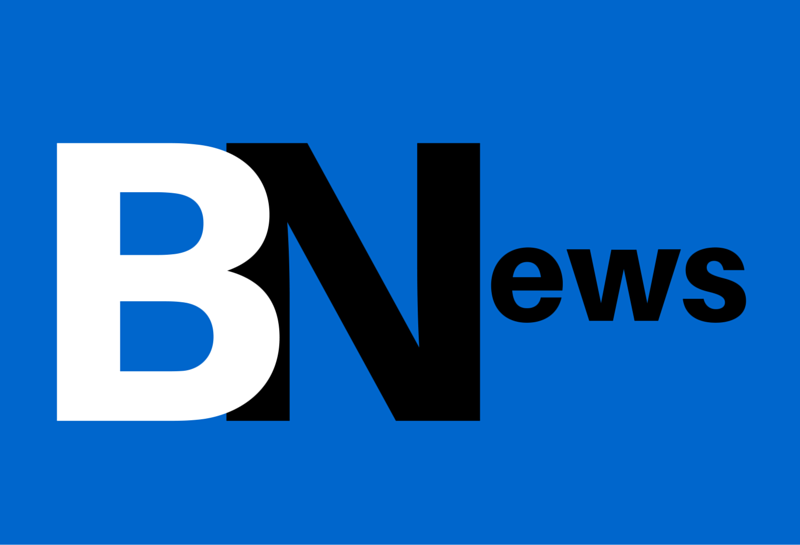 After the match, however, Sarri played down the incident with Arrizabalaga, who was bought from Athletic Bilbao for a record $90 million last year. 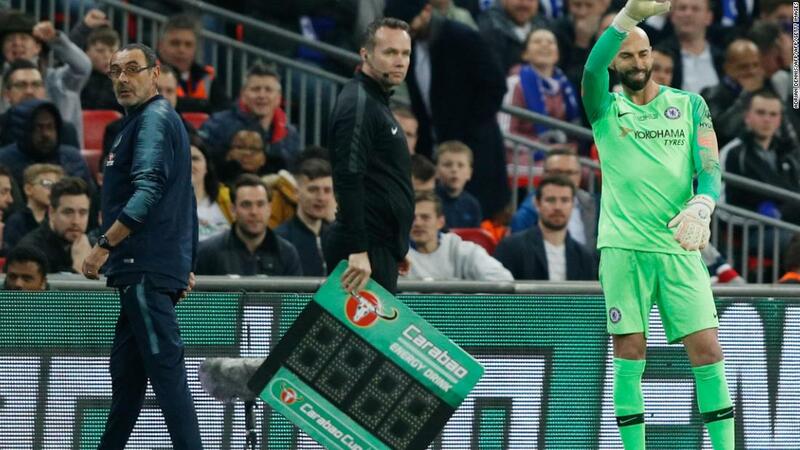 “There was a misunderstanding because I thought the goalkeeper had cramp so was unable to carry on for penalties, but that wasn’t the case,” he told Sky Sports. “The keeper understood I asked for the change for the injury, but he didn’t need to come off. It had been a valiant performance from Chelsea, which was thrashed 6-0 by City two weeks ago and exited at home in the FA Cup to Manchester United last Monday. 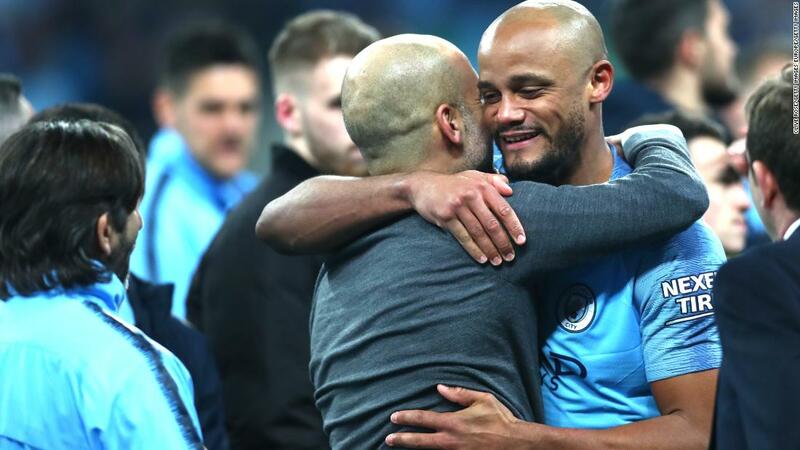 “I was impressed with the way Chelsea defended, they were well organized and one of the toughest teams I’ve faced in my career,” said Manchester City boss Pep Guardiola. “We knew they have pride and they would react. This game was more similar to the game at Stamford Bridge, which we lost,” the former Barcelona and Bayern manager added, referring to the 2-0 result in December. A large chunk of Chelsea supporters wanted Sarri, like Arrizabalaga in his first term in London, to go because of the poor results, his tactics and for refusing to play younger players. Chelsea owner Roman Abramovich has been known to have little patience with managers too but Sarri made it to Wembley and his players put in a great shift, especially in the second half when the Blues were the better side. Ultimately though it was City which retained the League Cup, and more silverware could be on the way. City trails Liverpool — which tied Manchester United 0-0 Sunday — by one point in the Premier League, is into the FA Cup last eight and has one foot in the Champions League quarterfinals after a first-leg win over Schalke. Aguero netted a hat-trick against Chelsea this month but was given some rough treatment right from the kickoff, fouled by Jorginho. Sarri kept faith with the Brazilian, despite much of the Chelsea faithful wondering why he has displaced the exemplary N’golo Kante in the holding role. Aguero flashed a half-volley wide in a largely quiet opening interval. The second half was anything but. 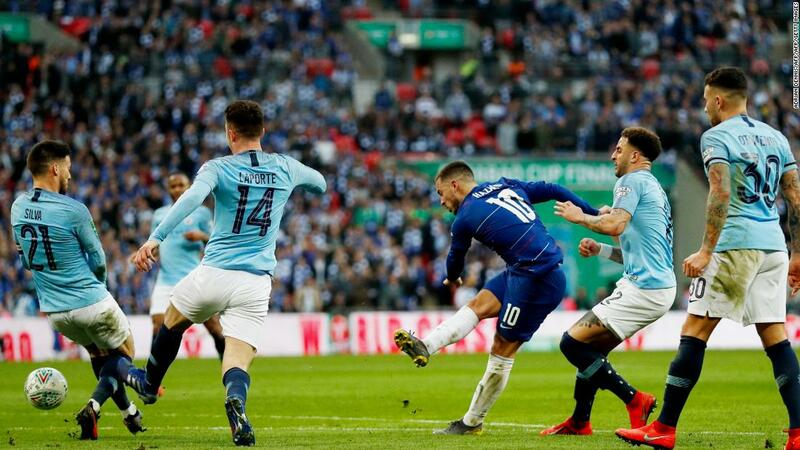 VAR confirmed an original call that Aguero was offside in the 56th minute when he poked the ball into the corner — it had to be by the narrowest of margins — and Kante shot over the bar 10 minutes later after Eden Hazard blew past City’s substitute defender Vincent Kompany. Pedro couldn’t find the hard-working Hazard with his pass when Chelsea threatened again in the 76th minute and Jorginho earned a yellow card for impeding a flying Sterling on a counter in the 88th minute. City keeper Ederson tipped over Willian’s wicked free kick in injury time and Hazard couldn’t have been offside by much when played through by Ruben Loftus-Cheek. Sarri bringing on Loftus-Cheek, 23, and 18-year-old Callum Hudson Odoi will have pleased the Chelsea fans seeking an infusion of youth. Aguero seemed to be tiring but the Argentinian caused havoc in the box in the second half of extra time before his shot was well gathered by Arrizabalaga with three minutes remaining after Chelsea defender Antonio Rudiger slipped. Arrizabalaga stayed down and then came his exchange with Sarri, who lost the tug of war with the keeper. A few minutes later, Chelsea would lose altogether.